Meetings are in Sedgefield Methodist Church Hall at North End Sedgefield TS21 3BT at 7.15 p.m. Everyone is welcome. 7 p.m. Everyone is welcome. 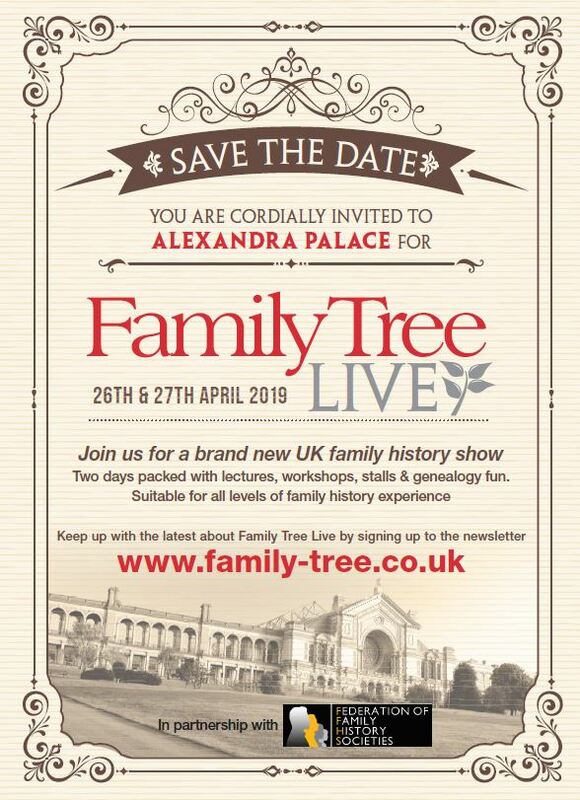 You are cordially invited to Alexandra Palace for a brand new UK family history show. Join us for two days packed with lectures, workshops, stalls & genealogy fun. Suitable for all levels of family history experience. Keep up with the latest about Family Tree Live by signing up to the newsletter www.family-tree.co.uk. Saturday 9:30am to 4:15pm on 1st Saturday of most months. Please check. Original items must be ordered in advance. Lunchtime lecture talks begin at 12.30pm and last for around 45 minutes with time for questions afterwards. Admission is £2, which includes light refreshments. Advance booking is not necessary. Please note: last document production is 45 minutes before closing.